Anastasia is a mum of two beautiful children and came in to see Dr Caroline Oh in the hope to fix her smile. She had a lot of work done overseas where her front teeth were filled with composite resins, which overtime have become discoloured and unsatisfactory. 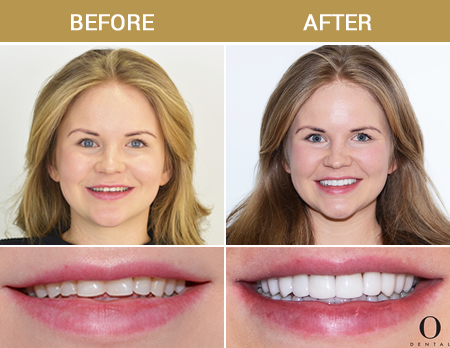 As a birthday present, Anastasia was able to get the cosmetic dental treatment she desired and the results speak for itself. Anastasia’s treatment was completed in 2 weeks with 3 visits. 1st Visit: Consultation with Dr Caroline. Photos, impressions and bite were taken to design her new smile. 2nd Visit: Trial smile and bite. This involved checking the aesthetics of the proposed teeth to ensure the patient was comfortable with the new smile. Teeth preparation was done after verifying the aesthetics. Seeing Anastasia’s beautiful new smile, we couldn’t be happier with the results! Anastasia’s transformation story is now being published in the new Vogue magazine where O Dental will be featured 2019 Feburary.